The Holidays have never been happier with Young Living!! Friends, yes that’s a 400 PV promo you see and a Unique NEW and Exclusive blend and an adorable diffuser ornament❤️😱😍 and Sacred Frank …I know! These promos are off the hook. You want to learn more ? Read on! But first… I want to make sure EVERYONE on Essential Rewards is signed up for YL GO or (my fave) YL GO plus. >> 400PV: Higher Unity (5ml), Glass diffuser ornament & Sacred Frankincense (5ml), Myrrh (5ml), Christmas Spirit (15 ml), Northern Lights Black Spruce (5 ml), and Nutmeg VitalityTM (5ml) per qualifying Essential Rewards order. >> 300PV: Glass diffuser ornament & Sacred Frankincense (5ml), Myrrh (5ml), Christmas Spirit (15 ml), Northern Lights Black Spruce (5 ml), and Nutmeg VitalityTM (5ml) per qualifying Essential Rewards order. >> 250PV: Myrrh (5ml), Christmas Spirit (15 ml), Northern Lights Black Spruce (5 ml), and Nutmeg VitalityTM (5ml) per qualifying Essential Rewards order. >> 190PV: Christmas Spirit (15 ml), Northern Lights Black Spruce (5 ml), and Nutmeg VitalityTM (5ml) per qualifying Essential Rewards order. >> 100PV: Nutmeg VitalityTM (5ml) per qualifying Essential Rewards order. Can I get an Amen for Adrenal support?! Around the holidays our Adrenal glands tend to get overworked with the stress of travel, later evenings, and the hustle and bustle of life . Swipe a drop of Nutmeg on the inside of your cheek for a quick pick me up or add a drop to your coffee. Nutmeg is also a wonderful oil to cook with as you prefer seasonal dishes! Be sure to checkout the non-vitality oil info page too! Did you know the ENTIRE tree is in this bottle- from needle to root?! And the oil in this bottle comes from trees that sit under the magical Northern Lights at our farm in Fort Nelson. Traditionally, Black Spruce trees have been believed to possess the frequency of prosperity! (Yes, please! I will take a gallon.) This oil is a big emotional oil – used to release emotional blocks and brings feelings of balance grounding. People who love Idaho Blue Spruce are equally drawn to this oil. It’s also gorgeous for the holidays! Diffuse with Orange and Frankincense and thank me later. This blend of orange, spruce and cinnamon is our favorite replacement for fall scented candles and room sprays. Place a few drops of Christmas spirit in your free diffuser ornament to give your holiday aromas a November start. Aromatically, this blend brings joy, peace, happiness and security. so yes everyone needs it 😂😂🙌. Also you CAN NOT get this oil in the 15ml bottle. The 15 ml size is exclusive to this month’s promo and trust me when you smell this you will be so grateful you have a 15 ml size. Just like Raindrop oils, these oils that do “all the things” 😉. High in sesquiterpenes, Myrrh can stimulate the limbic system, the seat of memory, so it’s a wonderful oil to use to work on past stored emotional trauma that is yours or that you could have inherited 😬. If you have “mommy issues” you might want to put a drop of Myrrh around your belly button daily – just saying. 🤷‍♀️Aromatically, it encourages spiritual awareness and is uplifting. It’s also a wonderful oil for youthful skin. Add to your Orange Blossom or Art Light moisturizer. You don’t need a tree to display this beauty! This is a year around glass diffuser if you ask me! Add a few drops of Christmas Spirit or an oil of your choose to the little “bucket” area and drop those little sticks in and you’ve got yourself an on the go diffuser for your Christmas Tree or even to hang by your bed. I mean friends, an exclusive blend just for us!!! Yes please!!! 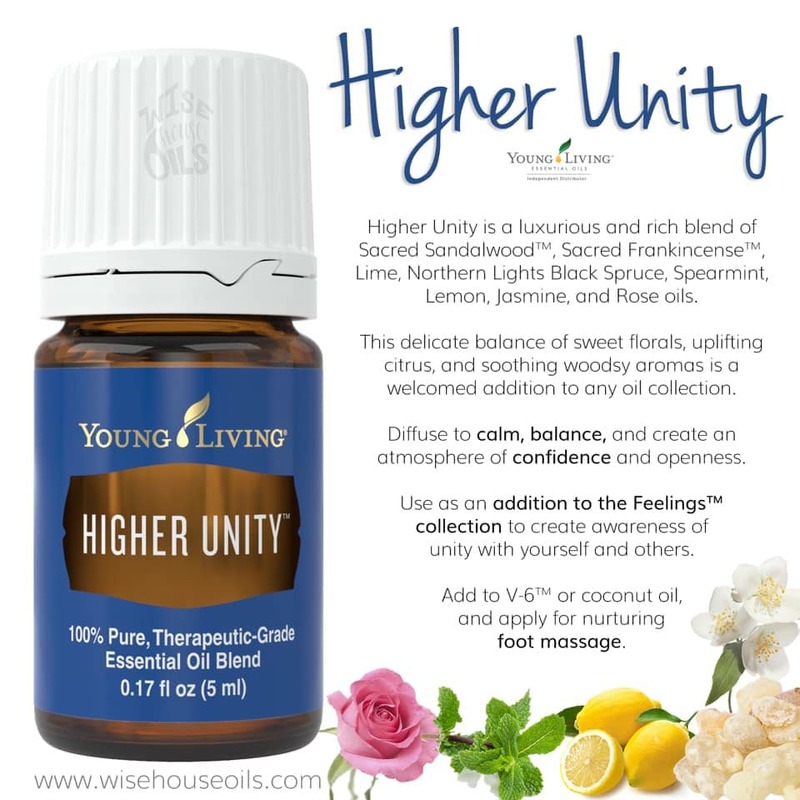 A grounding blend, Higher Unity combines Sandalwood, Sacred Frankincense, Lime, Northern Lights Black Spruce, Spearmint, Lemon, Jasmine and Rose essential oils. I mean this bottle sounds like not only will it smell like magical unicorn tears 🤣😂😍 but It’s filled with oils that are grounding like Sandalwood, Sacred Frank and Northern Lights Black Spruce and big heart openers like Jasmine and Rose. I can’t wait to smell this gorgeous exclusive blend.